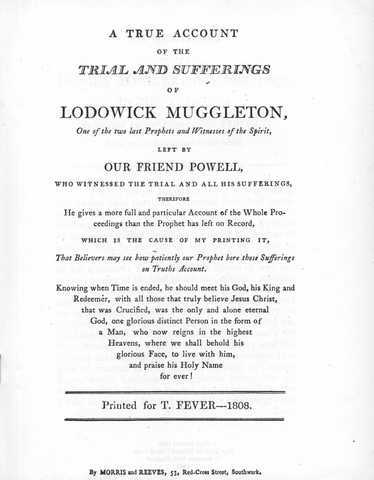 This is an interesting first hand account or Muggleton's trial and suffering in 1676, written by a disciple who was present at the trial, the public punishment and the attempts to free the prophet. While it is fairly clear that Muggleton was not proved guilty, he was most probably guilty of at least one count (selling blasphemous books) and only escaped the other counts on a technicality. The court decided to ignore the technicalities and find him guilty anyway. While the punishment was by today's standards quite brutal it seems positively mild compared to many of the contemporary punishments, the bulk of the account concerns the complex and ultimately successful attempts (that I really do not fully understand) to reduce the fine from £500 to £100. The law is quite interesting, but it is hardly a tail of brutal edge of a cliff suspense. Hymn ninety eight of "Divine Songs" records the proceedings in song. The Bibliotheca records that the publisher was a Birchite (a follower of a Muggletonian schismatic of the late 18th century who claimed that he enjoyed "immediate notice") however the contents of this account does not reveal any Reevonian leanings and it was included by the ultra orthodox Frosts's in "The Works". Mr Thomas Fever is also acknowledged as a subscriber to the 1808 edition of a "True Interpretation of all the Chief Texts of the Revelation of Saint John".